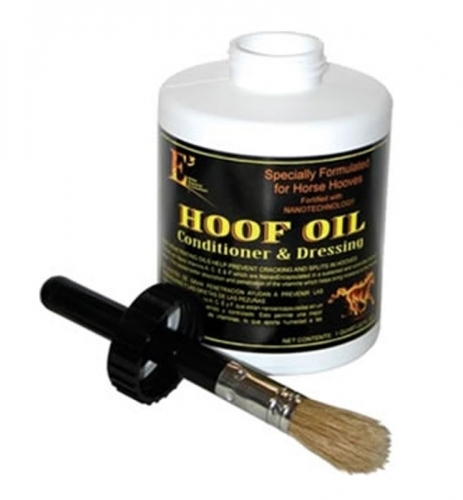 Hoof Oil Conditioner & Dressing is fortified with Nano Vitamins A, C, E & F, which are NanoEncapsulated in a sustained and controlled delivery system. This causes better absorption and penetration of the vitamins, which helps bring moisture to the hooves. It&apos;s specially formulated for horse hooves. We carry the entire line of Elite Equine products, including Tea Tree Shampoo, Antifungal Shampoo, Detangles and Shines, Thrush Clear, Insect Repellent, Liniment Gel and Brightening Shampoo. Be sure to check them out, for all your horse health needs.